Dies ist ein gut ausgestattetes Dorfhaus mit 4 Schlafzimmern im charmanten andalusischen Dorf Villanueva del Rosario, Malaga (ca. 35 Minuten Fahrt vom Flughafen Málaga). Das Anwesen ist ideal für entspannende Familienurlaube und umfasst einen großen privaten Pool, Billardtisch, unbegrenzt schnelles Internet, TV / DVD, Tischtennisplatte, Nintendo Wii, Gasgrill und voll ausgestattete Küche. Es ist nur ein paar Minuten zu Fuß zum Zentrum des Dorfes, wenn Sie in einer der lokalen Bars essen oder trinken möchten. Es gibt einen Kinderspielplatz weniger als 100 m von der Unterkunft entfernt, der von der Terrasse aus zu sehen ist. Dazu gehören Rutschen, Schaukeln, Basketballkörbe, Boules-Grube, sowie eine alte römische Wasserquelle, die die Einheimischen noch heute benutzen. Über dem Park befindet sich ein Fitnessbereich im Freien. Rosario ist auch ein sehr günstiger Ausgangspunkt, um den Rest von Andalusien mit Antequerra, Granada, Sevilla, Malaga und Cordoba leicht zu erkunden. Das Dorf liegt am Rande der beeindruckenden Gebirgskette Masif Peníbetico - komplett mit wilden Adlern - und eignet sich daher ideal zum Wandern, Klettern und Mountainbiken. Sehr schönes Haus mit vielen Extras in einem wunderschönen Dorf. Charming townhouse with lots of character set in a great location for experiencing authentic Spain. We had a great time at this property. The layout suited us as rather than being modern and open plan, the villa is a traditional town house with character and features such as beautifully finished beams and tiled floors, a little courtyard and different areas separating the house into individual spaces. We loved this as it meant we always had a degree of privacy if we wanted it and were not constantly around one another. The various little windows facing different directions made it a joy to wake up and look out to the mountain views and the street. The location is ideal as it is within walking distance to amenities and there are also roads behind the property leading to caves for anyone who likes to explore or climb. We found the local way of life to be very laid back and relaxed. No one is in a rush here! Great for us to experience a more stress free lifestyle but also means opening/closing times can be unpredictable and may take longer for service at restaurants. The location was also great for exploring further afield. We spent a day in Granada, a day in Benalmedina on the coast and visited Antiquera and Lobo Park (wolf park - highly recommend!). The property itself has everything needed including a traditional range gas cooker and other appliances, utility room with washer and dryer, plenty of clean linen, pantry, cooking and cleaning products, There is even a box of hats and sun cream. The pool area was great for us as there is plenty of seating and a gas BBQ. We had fun playing pool, darts and table tennis then having dinner on the patio with amazing views. 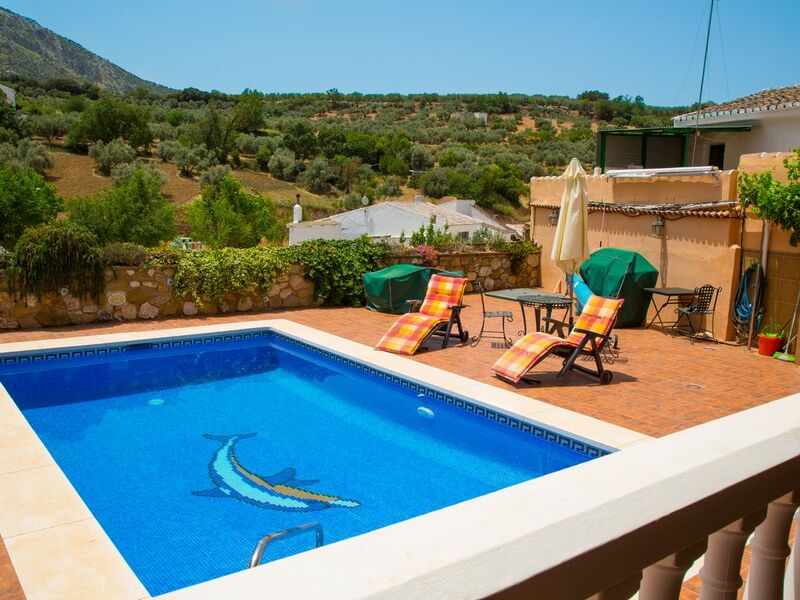 All round a great little find and would highly recommend for families or friends looking for a break in a quiet town with easy access to other parts of Andalucia. The hosts were great and were availabe to answer any questions we had. Many thanks for taking the time to post this review, Jill. I’m really pleased you had a great holiday and enjoyed the house and village. Look forward to welcoming you and your family as guests again in the future. Having rented a few properties in Spain and with some experience in the hospitality industry, this isn't the first time I have been disappointed with what appears to be a slightly amateurish approach by owners. On the positive side, the pool area is spacious and has beautiful views benefitting from a southerly aspect but with some shade on the pool in the morning and evening which is good for those of a fair complexion; outside shower is also very useful. Bedroom decor is attractive, simple and rustic and the bed was comfortable. However, none of the bedrooms on the first floor had a mirror of any sort and I had to use the ground floor bedroom as a dressing room and for hairdrying. I suspect the indoor seating areas are not much used, resembling a waiting room and the leather furniture is in need of a good clean as it smelt of stale sweat and oil/grease. Likewise the sun lounger cushions outside! I couldn't bring myself to use either one. The kitchen is in need of refurbishment with trim hanging off the countertop, kickboards missing and tiny ceramic sinks which are very impractical for food preparation or washing up. Kitchen/dining equipment could be improved. We noted the lack of a colander/sieve, only one mixing bowl, only 4 breakfast/dessert bowls. We found the cooker and barbecue rather unpredictable compounded by discovering that most of the restaurants in town were closed for the majority of the week necessitating rather more cooking than we would have liked. Unfortunately, there was nowhere to sit/recline in comfort in the shade of the balcony. The small table and chairs are uncomfortable for any period of time and the pool table takes up the other half of the space. The whole property suffers from a lack of effective spatial planning. The information folder gave little useful information regarding restaurants and business opening hours/days although we seem to have been particularly unfortunate in coming here the week before the local feria. We were told it is quite normal for businesses to shut down in preparation for this! Our week could have been better planned if we had known this in advance. Many of the issues could be easily overcome with a little more thought, care and applied logic. We made our thoughts known to the manager and I do hope that the owners will take proper advice on how to bring things up to a better standard. Thanks for your review, we value feedback from all our guests. In order to assist others who are coming we will try to respond to your points. We are not hospitality professionals; like most others on this site we share our holiday home to help defray some of its running costs. We also very much want others to discover the peace and beauty of the hidden gem that is our village and we do our best to ensure our guests get as much out of it as we do. Our house has not been architecturally planned, it has been added to by each owner and is charmingly “higgledy-piggledy”. We have 6 sunbed cushions - Rob brings out the number needed. They are clean but sun and swimming pool water bleached - we are looking to invest is some towelling covers for next season. We haven’t received any other mention regarding “sofa smell”, and to be honest cannot smell anything ourselves, however just to be on the safe side we will ensure it is thoroughly cleaned! There has always been a 3/4 length mirror in the second upstairs bedroom, so we are confused by this comment but will now obtain a mirror also for the master. The colander has been replaced as have the missing breakfast bowls. Things do get broken and go astray during the season, but we do our best to replace broken items as soon as possible. This is deep rural Spain - the bars and restaurants open and shut to their own chilled out unpredictable schedule although there is always somewhere to go and the more commercial sister village of Trabucco is only a 5 minute drive away. We are here right now and enjoying the stunning views you mentioned. Clean spacious Villa, with a lovely mountain view from the pool area. We stayed here for 3 weeks between June-July this year. It easily accommodated us being 3 adults,1x 15year old and 2x13 year old girls. The Villa is well appointed with everything you would need, beds were comfortable. Air-cons all worked but really didn’t need them. The Kitchen which has everything you would expect at home, and the two bathrooms are clean and more than ample, for all to use. An added bonus was having a utility room with washing machine and tumble dryer. It really was a home from home. There was plenty good quality towels and linen, that with a few washings we never ran out. There a normal under counter fridge in kitchen a large fridge freezer in utility room and my favourite beer fridge beside the pool table. The internet was actually better than at home, so all the kids were well pleased. Pool table, dart board, and ping pong table as well as a large pool. Plenty to do outside, as well as sunbathing on sun loungers whilst admiring the stunning views of the mountain ranges, they were even more stunning at night. The large BBQ was where we cooked most nights, everyone was more than happy with this although the cooker was used more than once. We bought 2 bottles of gas for the 3 weeks, but never finished the 1st one, that was with everyone using showers and cooking on BBQ pretty much constantly. Rosario is a very quiet, very Spanish town with white walled streets. There are a few small supermarkets in the town with the main ones about 20mins away in Antequera. There are several bars and a few restaurants. These are only open on certain days and we got caught out a few times going out for a meal to find them closed. Bad planning from us, however with kids having fussy eating habits the BBQ was always a winner. There is a communal pool that serves food and we used it several times during the day, the pool is clean and can be accessed for a small charge. We never bothered as we had the pool at the villa. There is plenty walking paths around the immediate area, with loads further afield. We only tackled the mountain path outside the house and I can vouch for it being a fair climb. The town itself is pretty easy to find from the airport between directions given and Google maps we had no problems. I really wished we had studied Spanish a bit more as Rosario is a really Spanish town, English is not their first language that’s for sure. Rosario was possibly too quiet for our teenage kids but they still really enjoyed it as we all did. Many thanks for taking the time to write such a detailed review which I am sure will be of help to other potential guests. I’m really glad you enjoyed your stay. We’re out in Spain at the moment and really enjoying the lovely weather and village life. Hope you think of us again for a future stay. We had a wonderfully relaxing early Easter break. The house is in a convenient and easy to reach location and is very well equipped and had everything we needed plus more. The pool table and table tennis table was a lovely added bonus and the pool was a good size, if a little chilly for the time of year! The weather was much warmer down by the coast but as this was only 30 minutes away this wasn’t a problem. Thank you for a lovely stay. Please note: We would request that a cash deposit against damage to the property of E100 be provided to our property manager, Rob, on arrival. This will be refunded in full, assuming no damage is caused, prior to your departure. We will arrange for you to be met at the property and shown around. If your arrival is after 9pm we will levy a small charge of E25, payable at time of arrival.